This is an account of a trip made by Alan K Jones, to Brazil, to see the Parrots that have so much directed the course of his life and work, in what can only be described as simply Living the Dream. This is Alan Jones' (Chairman of the PSUK 2016) personal account of a trip to Brazil to see first hand some of the conservation projects the PSUK is supporting, in particular the planting of 50 Licuri Palm trees in aid of the Lear`s Macaw conservation project to mark the 50th anniversary of the Parrot Society. All proceeds to the PSUK conservation fund. 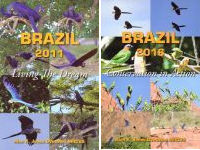 Buy both volumes and save even more, while helping to save parrots! Enjoy the beautiful photographs and add these stunning books to your collection, with all proceeds going to the PSUK Conservation Fund. Ideal Christmas present! Price includes delivery.